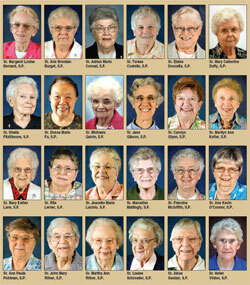 Click on the image above to see pictures of the Sisters of Providence who are celebrating their jubilees this year. 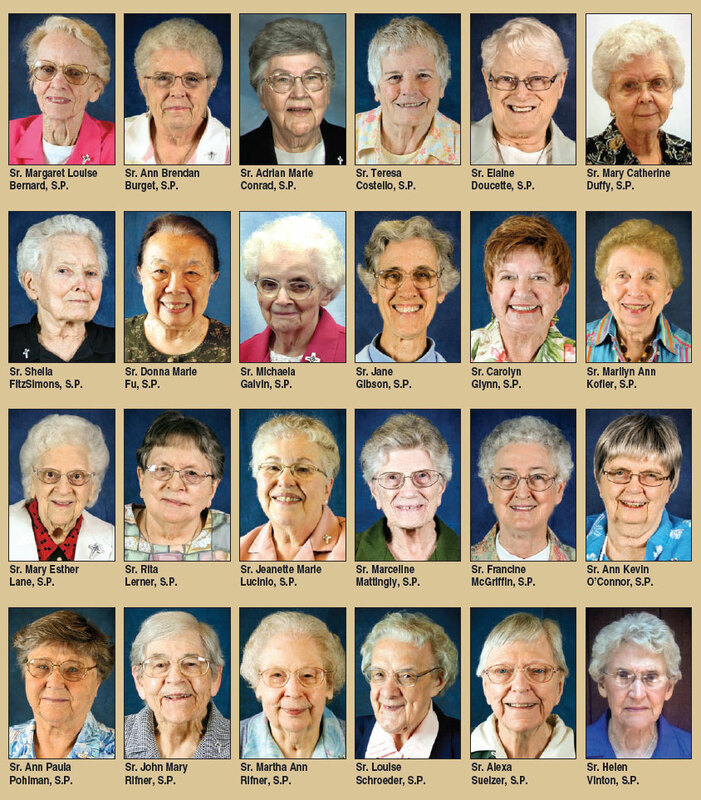 In 2013, two Sisters of Providence of Saint Mary-of-the-Woods celebrated 80 years in the congregation, two celebrated 75 years, seven celebrated 70 years and 13 celebrated 60 years. In addition to other ministries, all 24 sisters ministered in the Archdiocese of Indianapolis at some time, giving 504 total years of service within the Church in central and southern Indiana. Sister Mary Esther (formerly Francis Gertrude) Lane celebrated her 80th jubilee. In the archdiocese, she taught at St. Charles Borromeo School in Bloomington from 1940-41, the former St. Joseph School in Terre Haute from 1952-57 and St. Paul School in Sellersburg from 1957-58. In Indianapolis, Sister Mary Esther ministered at the former St. Anthony School from 1945-46, the former St. Agnes Academy from 1967-69, the former Ladywood-St. Agnes High School from 1972-75 and at Fatima Retreat House from 1975-76. Currently, Sister Mary Esther has a special prayer ministry at the motherhouse. Sister Marceline Mattingly celebrated her 80th jubilee. In the archdiocese, she taught in Indianapolis at the former St. Anthony School from 1938-40 and St. Philip Neri School from 1942-46. In Richmond, she ministered at the former St. Mary School from 1940-41. Sister Marcelline taught at Our Lady of Providence Jr./Sr. High School in Clarksville from 1968-70, and also served as pastoral associate at St. Mary Parish in New Albany from 1983-89, followed by ministry to the retirement community at Saint Mary-of-the-Woods from 1989-91. She ministered at St. Mary-of-the-Woods College from 1966-68, from 1991-93 and from 1994-2001. Since 2001, sister has volunteered in health care services. Sister Rita (formerly Edward Clare) Lerner celebrated her 75th jubilee. In the archdiocese, she ministered in Indianapolis at St. Matthew School from 1977-83 and at Saint Mary-of-the-Woods in residential and health services from 1983 to 2006. Her current ministry is prayer. Sister Alexa Suelzer celebrated her 75th jubilee. In the archdiocese, she taught in Terre Haute at St. Patrick High School from 1941-46 and at the former St. Agnes Academy in Indianapolis from 1946-50. Sister Alexa ministered at Saint Mary-of-the-Woods in several capacities: teacher and professor at Saint Mary-of-the-Woods College from 1962-65 and from 1982-2002; at Providence Juniorate High School from 1965-68; as a member of the Sister of Providence General Council from 1972-76; and in residential services from 2002-12. Sister currently has a special prayer ministry at the motherhouse. Sister Margaret Louise Bernard celebrated her 70th jubilee. In the archdiocese, she ministered in Indianapolis at the former St. Catherine School from 1945-46; St. Joan of Arc School from 1946-48; Holy Cross School from 1949-50; St. Philip Neri School from 1956-58; the former St. Anthony School from 1961-62; and St. Matthew School from 1962-63. Sister Margaret Louise also served at St. Paul in Sellersburg from 1969-70. She currently resides in Bradenton, Fla. Sister Adrian Marie Conrad celebrated her 70th jubilee. In the archdiocese, she served at the former St. Mary School in Richmond from 1946-50 and at the former Sacred Heart School in Terre Haute from 1972-76. In Indianapolis, she ministered at the former Bishop Chartrand High School from 1968-70; the former Ladywood-St. Agnes High School from 1971-72; and Cathedral High School from 1976-78. She provides volunteer service as an outreach minister in Los Angeles. Sister Sheila (formerly Marie Sheila) FitzSimons, a native of Indianapolis, celebrated her 70th jubilee. In the archdiocese, she taught at St. Thomas Aquinas School in Indianapolis from 1955-56 and as adult education teacher in New Albany at Providence Self Sufficiency Ministries from 1999-2002. She served in transportation at Saint Mary-of-the-Woods from 2002-10. Sister Sheila devotes time now to a special prayer ministry at the motherhouse. Sister Michaela Galvin celebrated her 70th jubilee. In the archdiocese, she ministered at Saint Mary-of-the-Woods in residential and health care services from 2000-11. Sister now devotes herself to a special prayer ministry at the motherhouse. Sister Francine McGriffin celebrated her 70th jubilee. In the archdiocese, she served in Indianapolis at St. Thomas Aquinas School from 1950-54; at the former Aspirancy High School at Saint Mary-of-the-Woods from 1963-64; at the former Ladywood High School and the former Ladywood-St. Agnes High School from 1966-72; as a licensed practical nurse at several Indianapolis facilities from 1973-76 and in adult education at United Southside Community Organization from 1976-81. When she returned to Saint Mary-of-the-Woods in 1997, she served for seven years on the residential services staff. Sister now has a special prayer ministry at the motherhouse. Sister Ann Kevin O’Connor celebrated her 70th jubilee. In the archdiocese, she taught at St. Charles Borromeo School in Bloomington from 1954-55 and at St. Matthew School in Indianapolis from 1963-64. At Saint Mary-of-the-Woods, she served on the General Administrative staff from 1994-97 and from 1998-2002 in various departments and programs. Currently Sister Ann Kevin’s ministry is prayer. Sister Louise (formerly Edward Louise) Schroeder celebrated her 70th jubilee. In the archdiocese, she served at St. Joan of Arc School in Indianapolis from 1959-62. Since 1991, she has ministered in various departments at Saint Mary-of-the-Woods, including residential and health care services. Sister Ann Brendan Burget celebrated her 60th jubilee. In the archdiocese, she ministered in Indianapolis at Nativity School from 1958-61; St. Jude School from 1961-65; the former St. Andrew School from 1965-67; and Holy Cross Central School from 1974-87. Sister Ann Brendan also served at St. Patrick School in Terre Haute from 1967-74; and at Woods Day Care/Pre-School, Saint Mary-of-the-Woods from 1987-2005. She currently volunteers in The Gift Shop at Providence Center at Saint Mary-of-the-Woods. Sister Teresa (formerly Ellen Maureen) Costello celebrated her 60th jubilee. In the archdiocese, she taught in West Terre Haute at Educational Family Services from 1995-96. Sister currently ministers as a citizenship teacher and visitor to the elderly in Weymouth, Mass. Sister Elaine (formerly Elaine Marie) Doucette served in Indianapolis at the former St. Agnes Academy from 1959-62 and St. Jude School from 1963-66. She ministered at Saint Mary-of-the-Woods in residential and health care services from 1980-98. Sister Elaine now has a special prayer ministry at the motherhouse. Sister Mary Catherine (formerly Marie Michele) Duffy, a native of Indianapolis, celebrated her 60th jubilee. In the archdiocese, she has spent more than 25 years serving the Hispanic community in Indianapolis and currently ministers at the Marian Center in Indianapolis in immigration assistance. She served in Provincial Administration from 1978-86, and taught at St. Matthew School in Indianapolis from 1986-87. Sister Donna Marie Fu celebrated her 60th jubilee. In the archdiocese, she ministered in Terre Haute at the former Sacred Heart School from 1956-57 and at the former St. Ann School from 1972. Sister currently is a vocation promoter for Asia. Sister Jane (formerly Dorothy Jane) Gibson celebrated her 60th jubilee. She ministered in Indianapolis at Holy Cross School from 1972-74; as housekeeper at the Cathedral from 1974-77 and at Cathedral High School from 1979-80; in outreach ministry from 1980-92; as a home health care giver from 1994-2008 and at St. Rita Parish from 2008-10. Sister Jane devotes time now to a special prayer ministry at the motherhouse. Sister Carolyn (formerly John Michael) Glynn celebrated her 60th jubilee. In the archdiocese, she ministered at the former St. Anthony School in Indianapolis from 1958-61. Currently, Sister Carolyn is a volunteer with Catholic Charities in Bradenton, Fla. Sister Marilyn Ann Kofler celebrated her 60th anniversary. In the archdiocese, she served in Brownsburg at St. Malachy School from 1959-61. Sister Marilyn Ann currently volunteers in immigration services in Chicago. Sister Jeanette Marie Lucinio celebrated her 60th jubilee. In the archdiocese, she ministered at St. Paul School in Sellersburg from 1955-56 and at the former St. James the Greater School in Indianapolis from 1959-60. She currently ministers as director of the office for women religious in the Diocese of San Diego, Calif. Sister Ann Paula Pohlman, a native of Indianapolis, celebrated her 60th jubilee. In the archdiocese, she taught at the former St. Catherine of Siena School in Indianapolis from 1968-74 and served as principal there from 1974-76. Sister Ann Paula currently tutors at St. Joseph School in Bradenton, Fla. Sister John Mary Rifner celebrated her 60th jubilee. In the archdiocese, she taught at the former St. Anne School in New Castle from 1966-69; at St. Susanna School in Plainfield from 1969-81; and St. Simon School in Indianapolis from 1981-85. She ministered at Saint Mary-of-the-Woods in the Transportation Department from 1985-2011. Sister currently volunteers at the motherhouse. Sister Martha Ann Rifner celebrated her 60th jubilee. In the archdiocese, she ministered at St. Michael School in Greenfield from 1966-68; at St. Margaret Mary School in Terre Haute from 1968-77; and served in the Transportation Department from 1987-2001 at Saint Mary-of-the-Woods. She continues to serve there in residential services.